Many of you will know me as just a facetious blogger who spouts off about random things from time to time. This is indeed true. What is also true, however, is that in a previous life I worked as a transport engineer. While nowadays I work primarily as a transport planner and an economist (roles in which I have more of a policy focus), from time to time I still find myself getting down and dirty with the application of basic traffic engineering principles. Over time these experiences have led me to form the opinion that the traffic engineering profession in New Zealand is, shall we say, pretty much broken. It’s broken largely because “standards” have been progressively used as a substitute for thinking. And we’ve basically chosen the wrong standards. We’ve chosen traffic engineering standards that 1) fail to acknowledge basic scientific/economic principles, such as minimum parking requirements and 2) prioritise vehicle mobility ahead of other more important socio-economic outcomes. Many of these standards have profoundly negatives impacts on our cities. In this recent post Matt presented one case study of a road re-design in Washington, in which he contrasted the designs for a corridor put forward by traffic engineers versus transport planners. Needless to say the options presented by the latter (illustrated below) appealed more to all of us here at TransportBlog. Not only do the options developed by transport planners have greater aesthetic appeal, but three of them also provide for additional land use development within the transport corridor. Indeed, traffic engineering practises that are currently applied in New Zealand (and to a greater degree Australia) do not even stop and consider the value of land. Land is so dam valuable, and the efficiency with which we use it determines, to a large degree, the productivity and amenity of our urban areas. The choice of design vehicle can have a massive impact on the degree to which a particular road supports, or more commonly undermines, socio-economic outcomes in urban areas. Working with a large design vehicle effectively puts paid to the types of narrow lanes and tight intersections that are ubiquitous in European cities (as an aside I’m writing this from Amsterdam, having just traveled through Paris, Porto, and Barcelona). 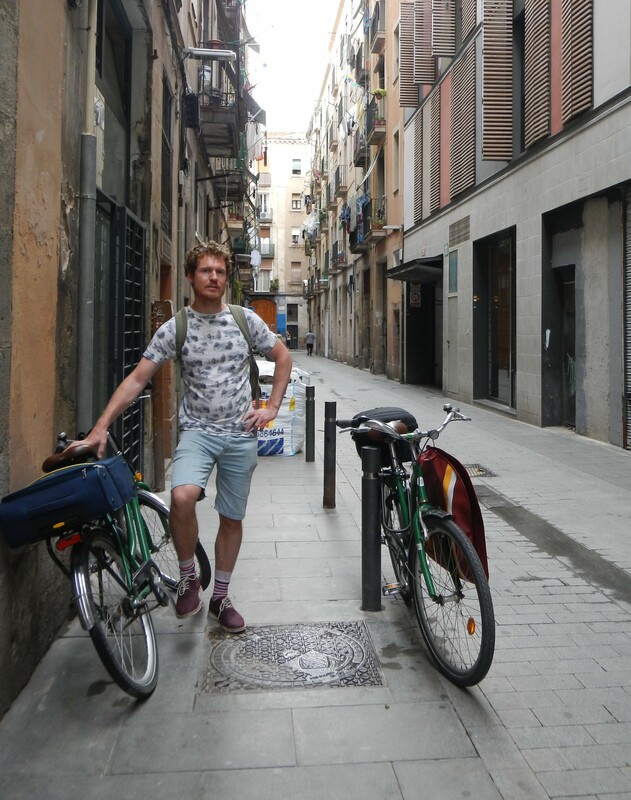 Here’s a photo of my bicycle and I in a narrow lane in Barcelona. 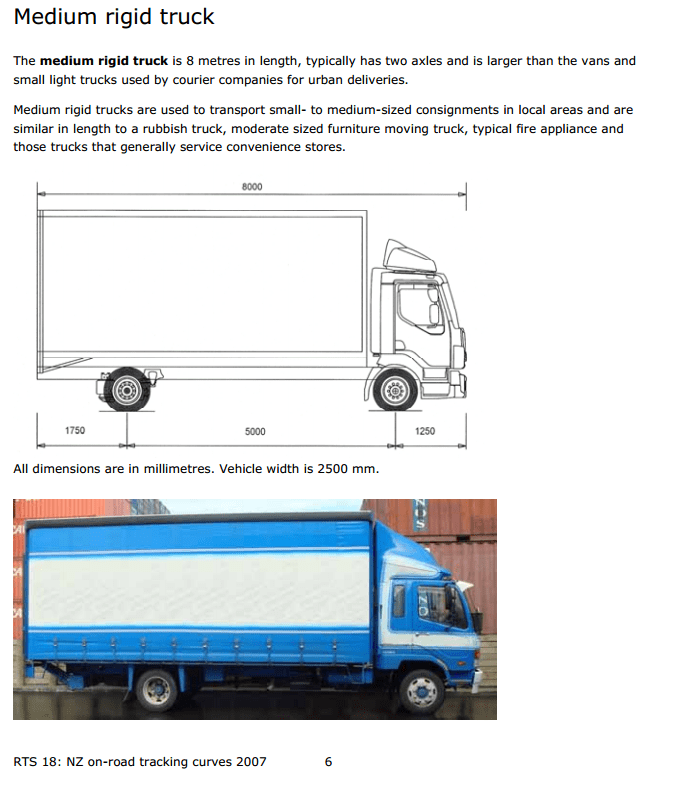 Alternatively, if you can convince your traffic engineer to use a smaller design vehicle then you can reduce the physical footprint of the road network. In my experience, however, the traffic engineering profession has developed a “gotcha” for anybody who dares suggest a smaller design vehicle be used. The “gotcha” is service vehicles, such as garbage trucks and emergency service vehicles. That’s right, the humble garbage truck, they argue, needs comprehensive access to every urban nook and cranny. In turn, our urban nooks and crannies are designed around the needs of the garbage truck, which is – perhaps needless to say – rather large. 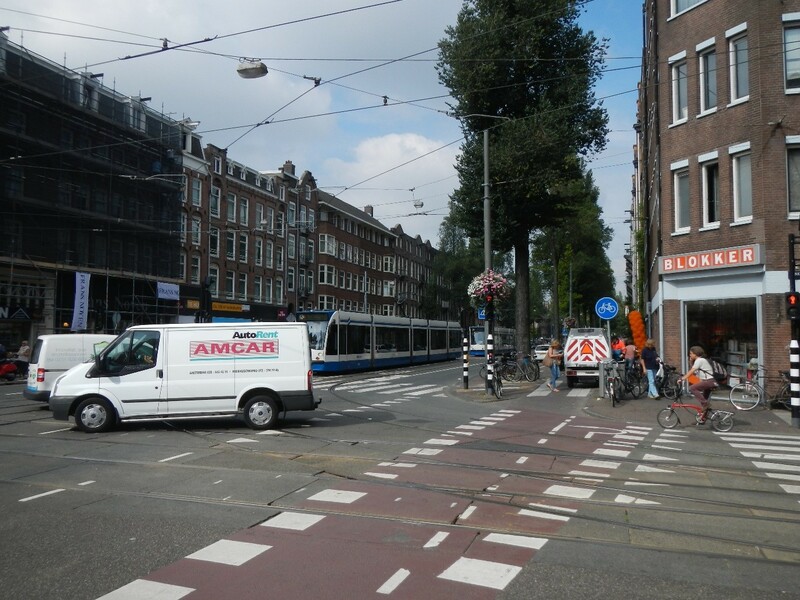 Now take a look at the photo below, which shows a relatively common streetscape from Amsterdam. You will notice a cycle lane running from the bottom left of the figure towards the right hand side of the figure. If you follow this cycle lane closely then you should be able to make out the back of a small vehicle that is parked in the cycle lane just outside the shop. This is, my friends, a rubbish truck. Which brings me to the point of this post. Amsterdam, like many European cities, designs their urban areas to deliver a broad range of socio-economic outcomes, such as walkability. This in turn requires narrower lanes and tighter intersection footprints. In response, they have effectively had to “down-scale” their rubbish trucks. In this way I think the traffic engineering profession in New Zealand and Australia has put the garbage cart before the community horse. More specifically, instead of designing the communities we want and then selecting the vehicles that can integrate with that design, we choose the vehicle first and subsequently design our communities around their needs. I suspect our approach is very, very economically inefficient insofar as it increases the physical footprint of the road network. Remember, in cities, space is always expensive! +1. Super post. How the rules that most of don’t even know exist actually shape our world. Fantastic post. You don’t post often Stu, but when you do you make up for it in quality. Where’s the gratuitous dog photo though? Thanks for the post Stu – a big bugbear of mine too. Regarding those trucks, a particularly telling example was me attending an AUSTROADS (our local standards body for roading guidelines, never mind the OZ name). After talking about the tracking requirements of big trucks, I asked the course presenter under what circumstances he feels it would be appropriate for a turning truck to sweep over the exiting lane of the street he’s entering (basically, that almost halves the width the side street throat has to have). His answer: Something along the line of “Pretty much never”. Now I accept that indeed, on many streets it would not be appropriate. But for a local residential street, with little traffic on that street, and with very, very few trucks ever turning down it? The mantra that even our biggest vehicles in our smallest streets should remain as un-inconvenienced as possible – it’s making it bloody hard to build human-scale local streets. And of course the intersection is exactly the place where a large-radius kerb is most deleterious to pedestrian amenity. In a low-volume, low-speed situation, I don’t see the problem. If I’m standing at the intersection in my car, blocking the path that the turning truck wants to sweep, clearly he will wait for me. If he’s already turning, blocking the lane that I want to drive along, clearly I will wait for him. There is a few seconds delay, but no risk to safety. It’s similar to the situation on a one-lane bridge. Which is why AUSTROADS doesn’t work. We need to look elsewhere. The Dutch maybe? Austroads, amongst its other aspects is primarily a rural / intercity link road design, similar to the ‘Design Manual for Roads and Bridges’ in the UK. What is required is an urban road/street design guide in the veins of ‘Complete Streets’ from Australia, Urban Street Design Guide by NACTO, and some elements of Manual for Streets (2) without the planning aspects. Without a major re-think in how we actually design our urban and sub-urban roads, we’ll end up constantly trying to use link road standards where they are not applicable. So a one off cost of turning valuable land into road OR an increased, permanent cost of requiring rubbish companies to maintain different fleets of vehicles which will just get charged back to rate payers? I’m not sure which is worse in the long run. How about fire engines, ambulances, moving trucks, street-cleaners? The same problem applies. I don’t disagree with your point, but if you are stuck with a 500yr old city layout, then you have to accommodate for that. If you are starting from scratch you build to cater to your needs to avoid the problems other cities have to face. I find it interesting to note that plenty of our older intersections in Auckland have swept paths that don’t meet standards and very likely overlap for heavy vehicles and yet we don’t have many incidents of head on collisions. Good point. Many of the best places in Auckland would be impossible to re-create using the standards we have chosen. Ari it’s not a one off cost, it’s the eternal, year-on-year cost of that wasted value in the poor land use. Of having valuable land doing nothing but sitting there under tarmac waiting for the weekly oversized rubbish to turn over it. Engineering, like planning, should be a creative act not simply a task for someone to look up a set of standards. Be careful, if the task remains as unambitious and uncreative as that all the jobs in the profession will be replaced by machines! Road engineering Bots can probably apply standards more efficiently than humans already; be afraid. Autonomous cars? Autonomous Engineers may come sooner…. Too complex – even greenfield sites have too many difficulties from my experience. So it won’t get replaced by bots, Patrick. But I do think that working in urban environments is much more fun, because it is so much trickier. Everybody needs to be concerned about how much of their current job can be automated. Get your arses over the creative side of the task, the side where a meat computer is required, or you may be in for an unpleasant surprise as this century unfolds. And I don’t just mean taxi and train drivers; automation will increasinly reach deep into employment; the drive to efficiency is unstoppable. Unless they also learn how to negotiate with Council officers and clients, they won’t be replacing me. With “continuos improvement” and refinement (and if Baxter can survive “best practice” without blowing up), and interfaced with AI (Artificial Intelligence) a Baxter-like unit could do just about anything reasonably well and reasonably cost-effectively. Even back in the 1920s it was thought that most jobs could be automated and were simply make-work to keep the ex-peasants busy and stop them from revolting. The employment system has been trying to hold back the tide for nearly a century, but the tide is coming in. Of course we will still need people for some jobs, but not many. As a society we’ll have to decide whether we ration the remaining jobs in some equitable way, and/or provide the means for full-time leisure (my personal choice). Other “solutions” are too terrible to even think about. I think the point of the post was simply that the benefits *and costs* of gold-plated engineering standards should be considered, instead of just blindly assuming that the preferred answer goes without saying, as in Max’s example. It’s an annoyance that I face regularly as well. Developers would be on your side too, as less roading would leave more saleable land, but standards are standards. Yes, rubbish trucks are a silly example of an everywhere vehicle. I’m sure Mr & Mrs Smith can’t waddle the 100m or so down to the front of their service lane/RoW to put the rubbish out. BUT! a fire appliance is not such a daft reason for this. You want the hose to reach your dwelling that’s on fire? Sorry, couldn’t make it as our vehicle didn’t fit down your street. Make all of our vehicles smaller you say? Well we wouldn’t be able to carry a large enough reservoir of water in case we didn’t find a fire hydrant near your location. That and it takes a quite powerful engine to carry all that weight around. Not saying I don’t agree with you, but the practicalities often outweigh the benefits. Fire Engines are basically mobile powerful pumps for he express reason that they are intended to and do pump high pressure mains water along all those big hoses to where ever it is needed – be that up a hydraulic fire fighting platform, or down alleyways and cul-de-sacs or even, inside a building. The distance they can do that is over a hundred metres, probably more. Many Auckland houses with infill properties down long rights of way would not accommodate a modern fire engine anywhere on their property, or even down the Right of Way, so the Fire Service would park their fire engines on the street and run hoses down the accessways, to the fire – a case of fitting the terrain not the design manual. Stonefields is a classic example of a planned suburb designed to these AUSTROAD rules, where in practice a modern fire (or delivery) truck would not be able to negotiate the street layout – in theory they can, but thanks to all those on street parked vehicles in practice, the answer would be no they could not drive to /park too near the property with the fire. And in some cases, to access the fire, the Fire Service would need to run hoses over two hundred metres to fight any decent fires there. They can do that, they may not like to do it, but on the face of it, how many fires is the fire service actually fighting down these wide roads versus the forever allocated space taken up with assuming that they will be down there fighting fires regularly. But Greg makes a good point: often better to design the communities you want and then adjust vehicles to suit. Fire engines, nor rubbish trucks, need to be able to turn into a residential street entirely in their own lane. It’s a silly standard. From what I’ve heard fire is not just a southern hemisphere phenomenon. True story. In the apartment in town, the bins get rolled along the alleyway to a narrow service road which rubbish trucks (and I presume fire-engines) deal with just fine. One of my places has all the garbage go into a skip, which is picked up once a month by a truck that manages to negotiate the single lane rear lane driveway and the parking floor just fine. Yes Stuart, but they recognised best practice urban design earlier and have adopted their Fire Service and engines to suit. I’m pretty sure you would be laughed out of every Auckland fire station if you told them to go out and but a whole bunch of new smaller appliances. I read a story just recently that suggested that suggested that since areas with wider lanes have lower density any speedups of emergency vehicles is lost because they one average have to travel a greater distance. Very pertinent issue well-explained. A clear example of how we can become so focussed on the trees that we lose sight of the wood! The prevailing assumption that pretty-much every road vehicle must have the freedom to go pretty-much everywhere is the underlying problem here. When I see B-train combos rumbling down our residential street and around the tight roundabout at the bottom just in order to service our local supermarket, I see gross inappropriateness in play. And when I see urban streets being rebuilt and re-scaled in order to accommodate this level of inappropriateness, I see a worse level of inappropriateness at play. And always there will be an excuse why it has to be this way, why there is seemingly no alternative. As usual, some valuable lessons can be learned from railway-operation. On railways there is a concept called “running rights”. A particular rail vehicle will not be allowed on a particular route unless it has running rights. These can only be granted after careful consideration and analysis that everything will operate and fit appropriately. No running rights = no access. However because pretty much every aspect of railway-operation is planned before it happens, such restrictions can be planned around. Appropriate vehicles are programmed to run on appropriate routes. In some cases, special vehicle fleets are procured to operate on specific routes and handle specific traffics. To adapt the entire rail network to cope with the largest or heaviest vehicles would be gross overkill. The difference with roads is that their operation is unplanned and haphazard. The economic and social cost of allowing a ‘one-size-fits-all’ mentality is huge and unnecessary, but a collective social blind-spot prevents most people from seeing the inappropriateness of this, or of questioning the excuses that underpin it. Rubbish Direct use smaller trucks (not quite as small as the one in the above picture), which makes it easy for them to get around the narrow roads in our apartment complex. the problem goes down to individual sites where it is expected that perfect turning circles are provided on individual lots. god forbid someone having to do a 4 or 5 point turn on their own property. The result are larger than necessary driveways and on-site turning areas at the expense of indoor and outdoor living spaces. Swept paths are an interesting topic and one that I deal with quite a bit. I am of the opinion that the once a day/week vehicle (sometimes even those that come more than once a day as well) can pass over the centreline as the impact on vehicle movement is limited, but the benefits are huge to the other users; pedestrians have less distance to walk, less ac/chip seal to maintain, less impermeable area to deal with storm water (important in the PAUP context) and a much better built form / context. The additional space made by using smaller radii can be put to good use for WSD for road drainage or other communal activities. Really, residential roads should be designed, again in my opinion, to service the car and the fire engine (due to insurance rules apparently, a fire engine cannot push past other cars and damage them even in an emergency) and buses on bus routes, with all other vehicles being a compromise for that small moment when they exist on that route. This should go up the road hierarchy accordingly and primarily follow context and place. This would certainly change how our roads are designed and how they are used, may even have an interesting affect on driver behaviour. I understand they are allowed to do exactly that if they have reason to believe a life is in danger. Wasn’t there some publicity when the old North Shore council consented Unsworth with some streets too narrow with cars parked on them? Nice work by the developer slipping some more saleable land past them. On a 6m wide street with parking bays (even a 5.5m wide street) there is no reason to have to do so. At the same time, the streets are ‘human scale’. The biggest problems are a) 10m wide streets with no parked cars and b) huge entrances to said streets. Crazy stuff. You can build really narrow streets if you want. You just cant vest them to the Council as part of a subdivision. That means if you want narrow streets the owner needs to take responsibility for their own servicing- fair enough. But if you want the community to carry the cost of collecting rubbish then you need streets that can accommodate the trucks used for the council collections (the size is chosen to keep costs and therefore rates down.) But feel free to make your streets as narrow as you want. Just understand that someone at the Council will ask you how you will collect rubbish, receive deliveries and put out fires. If you make your own provision for a private rubbish collection, pumps and a fire system so you dont need the fire engine and some sort of means to move goods around then there will be no adverse effects and the Council must consent it. It all comes down to cost and whether you want to pay it. Reductionism to the smallest common denominator left. Ignoring, on the way, the argument that this blog article makes – that society should consider and weigh the trade-offs (like whether a more walkable and safer roading environment is worth having a slightly more involved rubbish arrangement, yes even one paid for by Council). Well of course it is about costs and benefits. Who ever thought it was anything else? It is about developers trying to reduce their costs as much as they can get away with and still sell the product versus the Council trying to prevent them externalising costs that have to be picked up by the community. You can build a narrow lane but you will be responsible for operating it, not the Council. If you want the Council bog standard services then build the bog standard facility for them. HOWEVER, existing road standards and practices mean that developers of new subdivisions build roads that are a lot wider than required for most normal activities. This means that councils, which ultimately must pay to maintain the roads, must spend more resurfacing those roads. How much more? Well, I’d note that reducing the lane width from (say) 3.5m to 3m would result in a ~15% reduction in the width of every street. That’s actually quite a lot of tar seal that councils must pay to maintain in perpetuity. I’m not aware of any attempt to conduct a cost-benefit analysis of these rules. I agree with you Peter. I have been doing 3m lanes for years as they result in lower traffic speeds. The only time I do 3.5m in 50km/h areas is when AT’s bus operations people demand it, which is basically every bus route. I always put forward the option of tracking across both sides to reduce the size of intersections but they seldom get built that way as the AT representatives seem to see their role as shaking down developers to build as much of everything as they can get. (I think they compete internally to see who can cost developers the most money). The problem is that nobody appeal a subdivision consent to the Environment Court as the time delay and finance costs exceeds the potential saving. Whereas you always appeal a dud landuse consent for a commercial development as the potential gain exceeds the costs. Nice one! Glad to see you’re pushing them on this issue as I think it’s a really important one. 6m is no problem for AT apparently. 6m doesn’t get you past AT if it is a bus route and then they demand 1.8m wide footpaths either side, separate 1.8m wide cycle lanes, berms for Africa so services are not under their pavements, on street parking, separation widths between the parking and cycle lanes, landscaping strips and then to cap it all off they want you to collect and treat rainwater so make more space for a swale and onstreet rain garden. Dominion Road is only 20m in parts but I cant fit AT’s requirements for a residential street into a similar width. Honestly the width for a vehicle carriageway is now a minor part of any new road. My experiences with the utilities companies in Auckland are that they do not want their services under the footpath as they do not like the access costs should they need to do anything… I’ve tried many times to convince them otherwise but at the moment they’re not very keen. Hopefully they’ll change their minds when they realise that AT cannot maintain everything to the widths that roads used to be. The whole process has become a gimme. AT and the utility companies dont pay for the land so they ask for lots of it. If the Council had to purchase their new asset off the developer then suddenly we would get an efficient provision of road space and the standards would narrow. They seem to cope just fine in Wellington, most of which doesn’t have berms. Indeed, it’s a good thing: Wellington’s footpaths tend to get resurfaced more often since they get dug up to access the services. Auckland’s footpaths just get let to fall into utter disrepair. mfwic; too true I’m sure! Tangential to the transport and urban design issues, this a great reason for the Council to encourage people to produce less waste. In Nelson we have had a crack at the whole narrower streets idea. See http://nelson.govt.nz/environment/nelson-resource-management-plan/nelson-resource-management-plan-2/view-the-nrmp/land-development-manual-2010/ which replaced the old engineering standards. It allows things like tracking over both lanes for lower order roads. It’s by no means perfect but is a start. The biggest complaint we have is how do you reverse you boat trailer into your garage from a 5.5m carriageway with parking in the lane? And yes, I’m a traffic engineer. Interesting. I guess we’re assuming that most applications for narrower urban lanes would for places where boat parking isn’t likely…. No one is suggesting taht all strrets get narrowed but rather some are able to be. And good on Nelson! We tried out some 5m carriageways in North Shore in the mid 1990’s but they got push back and the fire brigade didn’t like them. Not that they were experts but once they were involved people felt they might die in their beds or something so they went up to 6m minimum. 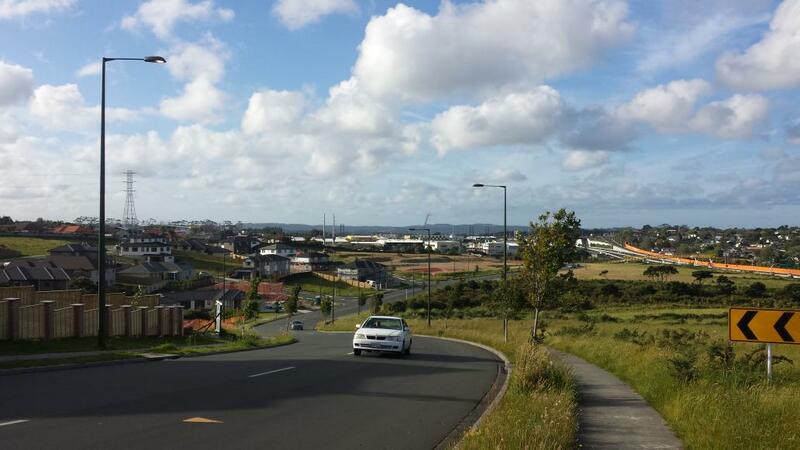 “They seem to cope just fine in Wellington, most of which doesn’t have berms. Indeed, it’s a good thing: Wellington’s footpaths tend to get resurfaced more often since they get dug up to access the services.” – Would it help further if we reverted from concrete to asphalt footpaths ? Lower cost. Easier to access services and restore properly.